Safety, cost and compliance are three of the major factors fleets need to consider when determining when to replace tyres. Each has an impact on the others: for example, set a higher minimum tread depth for when tyres are changed for safety reasons and costs increase, but if a fleet waits until they are close to the 1.6mm legal tread depth limit then they run the risk of breaking the law. “As always, it’s a balance between operating costs for a fleet and the operational needs of the fleet,” says Lee O’Neill, operations manager at Venson Automotive Solutions. Fleets typically operate a policy of 2mm, although organisations such as safety charity Royal Society for the Prevention of Accidents (RoSPA) and the National Tyres Distributors Association call for tyres to be changed at 3mm. 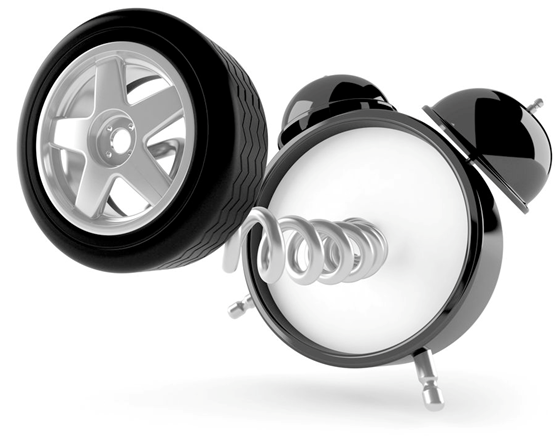 So how can a fleet manager decide when is the optimum time to replace tyres on their vehicles? Here we look at the factors they need to consider. New tyres typically come with 8mm of tread, and staying on the right side of the law means a minimum depth of 1.6mm in a continuous band across the central three-quarters of the tyre width around the entire circumference of the tyre. Drivers whose tyres fail to comply with the law risk a fine of up to £2,500 and three penalty points for each illegal tyre, while there may also be a risk of prosecution for the employer if it is a company vehicle. The regularity of tyres wearing below the legal limit was highlighted by a survey of more than 340,000 replaced tyres carried out by TyreSafe in partnership with Highways England at 819 retail outlets last year. Of these, 27% were found to have less than 1.6mm of tread. “Our research suggests that the concern arises not just from the number of illegal tyres at the point of replacement, but also the proportion which were below 2mm,” says Stuart Jackson, chairman of TyreSafe. “These have just 0.4mm left – which is half the thickness of a bank card – before they reach the 1.6mm legal minimum. However, Lee O’Neill, operations manager at Venson Automotive Solutions, adds: “Typically, we change tyres at 2mm which provides a leeway for drivers, reducing the risk of them going below the legal limit. “But the key to replacing tyres is flexibility. For example, if a driver has a tread depth of 2.4mm and is having the vehicle for another year, it might be practical to change the tyre early. Tyres have a vital role to play in the safety of a driver. “Too often tyre management is overlooked and there is a tendency to forget that the only thing keeping the car on the road is the palm-sized contact patch of the tyre,” says David Howe, fleet and retail channel manager for Goodyear Dunlop. Key to this grip is the tread which, on wet roads, channels away water so the tyres can grip the road surface beneath. If the tread wears too low then cornering, performance and braking suffers, while the risk of aquaplaning dramatically increases. “In the wet at 70mph, the stopping distance of a car fitted with a new tyre with 8mm of tread is calculated to be almost 100 metres; with 3mm a car’s stopping distance increases to 150m; and with 1.6mm a car’s stopping distance is 200m – double that of a vehicle fitted with a new tyre,” says Andy Fern, fleet sales director at Kwik Fit. But Jamie McWhir, customer engineering support manager at Michelin, believes fleets fitting premium brand tyres give themselves a definite safety advantage. “Braking distances depend on a wide range of factors,” he says. “The braking system, ABS sensors, road surface texture, weather – both humidity and temperature – as well as tyre pressure and temperature and the driver’s actions all play a significant part alongside the tyre’s intrinsic qualities. “When new, tyres can already exhibit large differences in performance between brands and manufacturers, models and dimensions. “For example, premium tyres may, with a tread depth of 1.6mm, be more efficient than a new budget tyre. Changing tyres too early can have massive cost implications for fleets, says McWhir. “Replacing tyres as soon as the tread depth reaches 3mm or 4mm inevitably means doing so more frequently which represents a significant increase in running costs,” he adds. He says research carried out by Michelin shows that changing a tyre with 3mm or 4mm of tread remaining – instead of 1.6mm – equates on average to an extra tyre per company car every two years. “That’s a scenario that most fleets would not be prepared to entertain,” adds McWhir. “It would also have a notable impact on fleets as a result of the higher total cost of ownership. Fern agrees the cost implications are potentially “significant”. “New tyres typically arrive from the factory with just less than 8mm of tread, so, with a 2mm tyre tread policy, there is close to 6mm of usable tread,” he says. “Moving replacement from 2mm to 3mm will increase tyre costs by one-sixth. According to Michelin, the rolling resistance of tyres also needs to be considered. This is responsible for 20% of a car’s fuel – or electric power – consumption and the figures improve when tyres aren’t new. “Michelin considers that replacing tyres prematurely would see annual fuel consumption rise by 900 million litres, and CO2 emissions by three million tonnes – or nine million if we were to add the loss of material caused by premature tyre replacement,” says McWhir. Increasing the frequency with which tyres are replaced can also have a significant environmental impact, which companies with a strong corporate social responsibility may take into account. “Numerous materials and a certain amount of energy are required to make a tyre,” says Michelin’s McWhir. “The more material used, the greater the impact will be on the environment. Recycling is also heavy on energy consumption, he adds, and the more materials manufacturers have to recycle, the lower their overall sustainability performance. “Increasing the legal minimum tread depth Europe-wide from 1.6mm to 3mm would amount to 1.5 million tonnes of raw materials wasted annually, equating to an energy demand of 290 million tonnes of crude oil,” says McWhir. When it comes to minimising the downtime linked to changing tyres, industry analysts agree that drivers need to take personal responsibility and utilise mobile support fitters whenever possible. “There are several ways drivers can ensure downtime is managed efficiently, including using mobile tyre fitters, booking fittings outside of the organisation’s peak work time and phoning ahead to ensure the supplier has the correct tyre available,” says Lovett of LeasePlan. O’Neill of Venson Automotive Solutions adds: “We encourage drivers to behave proactively, pre-ordering tyres rather than waiting until absolutely needed or illegal. “By doing so this means that when they do go to have tyres changed the process is quick and has them on the road as soon as possible, ensuring vehicle downtime is kept to a minimum. Fern of Kwik Fit stresses the benefits of mobile repair support. “Reducing fleet vehicle downtime is critically important to fleet operators as they continually seek to reduce operating costs,” he says. “As part of Kwik Fit’s range of services focused on assisting customers meet compliance, our mobile technicians undertake vehicle health checks. “A visual inspection of the tyres is followed by a more in-depth check with tread and pressure levels taken and findings recorded. Ted Sakyi, group fleet manager for Wates, believes that every tyre should be replaced “without delay” when they get to a depth of 2mm. “You cannot put a price on a colleague’s safety – and this has to be the overriding issue when it comes to tyre tread depth,” he says. The Surrey-headquartered construction company has a fleet of 1,033 light commercial vehicles, 300 company cars and 1,300 cash allowance drivers. Each of the three leasing companies Wates works with – Lex Autolease, Arval and Alphabet – also ensures that all vehicles have their tyres changed when they reach a 2mm tread depth. “It’s something that we place a premium on,” says Sakyi. “For example, all of our company car drivers have tyre gauges to assist them to carry out their own checks which we encourage them to do regularly. Sakyi maintains this is the most effective way to minimise downtime as it allows drivers to get on with their jobs while tyre professionals ensure that everything is as it should be. Asbestos removal specialist Rhodar changes tyres when they reach 2mm tread depth because it ensures there is no uncertainty when it comes to demonstrating full legal compliance. “It’s all about making 100% certain that colleagues are using the safest possible tyres,” says Steve Haigh, group transport manager. Haigh has placed an emphasis on tyre safety since he joined Rhodar in 2010 and the company’s 190 vans and 85 cars are fitted with Michelin tyres through ATS Euromaster. The company requires all van drivers to carry out a daily inspection of tyres prior to taking the vehicle out while also stipulating that all company car drivers carry out monthly checks. “When it comes to ensuring that your fleet’s tyres are as safe as possible, I think it’s essential to fit a premium brand,” says Haigh. “Premium brand tyres last far longer than cheaper alternatives and are integral to demonstrating that you’ve placed a premium on duty of care when it comes to the safety of colleagues driving those vehicles. Tyre choice & tread depth for replacement is nowhere near as important as getting drivers to fully understand tyre checks and why it is important to do it. Let's deal with the weakest link first!